This is a collection of contemporary documents published between 1780 and 1855 which relate to the mills and their work. This advertisement appeared in the Nottingham Journal in 1780. It refers to the need for workers at the Papplewick mills – either Top Mill or Old Mill. Interestingly it attempts to attract men with families – who could also work at the mills. In 1795 Walter Evans of Dailey Abbey wrote to the Robinsons. It gives an interesting insight into working practices of the day. This advertisement appeared in the Nottingham Journal in 1831. It advertises an auction of small machinery to take place at the mills, now that they have closed. 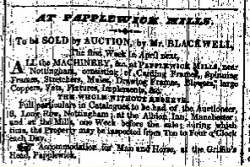 This advertisement appeared in the Nottingham Journal in 1834. 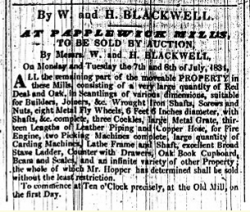 It advertises another auction of equipment to take place at the mills. published in 1855, (p. 35), noted that the mills were still standing, though unoccupied.